Ask for a Free Comparative Market Analysis. A well priced home will generate competing offers and drive up the final sale value. 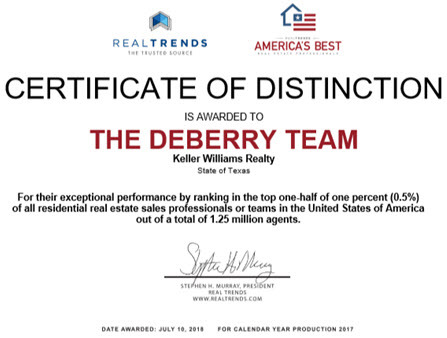 The DeBerry Team’s free market analysis takes into account the most actively searched prices and home values in the North Dallas and Plano TX areas. When you have a detailed CMA (Comparative Market Analysis), you can put the value of your home in perspective by using objective measures. Sell Your Home with a Professional. As experienced, leading North Dallas and Plano TX REALTORS®, our highly tested and proven marketing plan will take the guesswork out of selling your home. See What's on the North Dallas and Plano TX and Surrounding Areas Real Estate Market. Use the search tools on this site to get an idea of the competition. Connect to a leading professional. Contact us anytime you need to know what's really going on in this market. We are here to answer your questions about houses, schools, new home building developments, regional development plans, and much more. Call us without obligation. We will make sure that your listing gets the best exposure and reaches the right buyer—whether that buyer is out of state, in another country, or just around the corner! Please fill out the form below for your free Comparative Market Analysis.